You’re ready to flip your classroom. You’ve seen it done with the usual tools and methods – screencasts, teacher-created videos, Khan Academy, or other curated videos. But what if you could flip your lesson in a fun and humorous way? Instead of filming myself explaining a concept, I prefer to use the colorful and unique characters from GoAnimate for Schools to do it for me. For example, when reading Edgar Allen Poe’s “The Tell-Tale Heart,” my students encounter quite a bit of irony in the story. I can make a presentation slideshow and add a voiceover, but that’s just not my style. I’d much rather rely on GoAnimate for Schools’ myriad of interesting characters to create a more engaging lesson. However, if I ended my lesson with just the animated video, then I’ve only accomplished half of my goal. Where’s the inquiry, the collaboration, the discussion, or life of the lesson? In many flipped classrooms, teachers assign a video for students to watch for homework and sometimes they include some form of teacher-driven assessment to hold students accountable. In my classroom, I teach my students to collaboratively find the answers through self-directed inquiry. 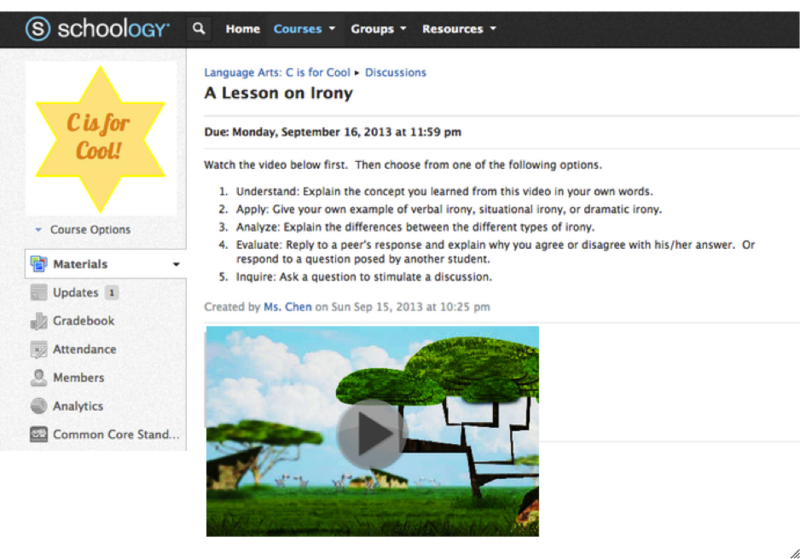 Enter GoAnimate and Schoology – a more exciting way to flip your classroom. Schoology is my Learning Management System of choice, and it’s a perfect platform where I can seamlessly embed my GoAnimate videos. 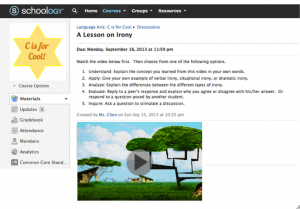 Because I want my students to discuss and question what they’re learning, I prefer to post flipped learning materials under Schoology’s discussion forum. After watching a short and funny GoAnimate clip that explains a new concept, my students can demonstrate their understanding by posting directly underneath the video. They can ask questions about what they just watched or explore ideas beyond what was covered in the video. The key is to train students to do this, and once they are, they will amaze you with their answers. With the GoAnimate for Schools app on Schoology, you’re not just flipping with videos. You’re now flipping the learning by giving students a chance to engage and explore together on a platform built for social learning. After watching my GoAnimate video on irony, my students were astonished to discover I had created it. When I told them that they will be making some of their own animation videos, they cheered – literally. My students can’t wait to take the learning into their hands. Thanks, GoAnimate, for another successful lesson!